MAGGIE'S is looking for people to join their walking team for the annual Wirral Coastal Walk, which takes place on Sunday, 24 June 2018. All money raised by the walkers go to Maggie's Merseyside, a warm, welcoming place where you can meet people who are experiencing the same things you are, find support groups specific to your needs and get advice and information from our professional staff. 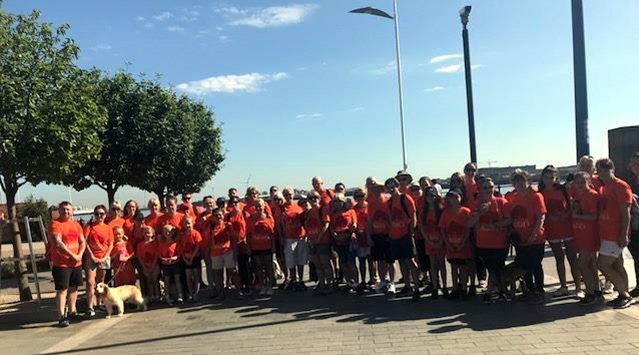 Centre Head Kathy Wright says:- "In 2017 we were overwhelmed by the fantastic support of our walkers; with over 100 people putting on an orange t-shirt and taking on either the 4, 10 or 15 mile course. The team raised an incredible ₤15,000 for our Centre. This year, we've launched our 'Million for Maggie's' appeal and so are appealing for people to take on the challenge for us, to help us raise funds for a new, permanent Centre on the Wirral. The psychological and emotional support me and my team provide has been shown to significantly reduce anxiety and depression, and so we'd really appreciate any support for this vital service. You don't need an appointment at Maggie's and all our support is free." 1 walker, Philippa, who took part in 2017, said:- "It appears to me now, as the terrified partner of a person with this incurable disease, that Centers like Maggie's enable patients and families and friends of cancer patients to live as normal and positive a life as possible, whilst finding ways to deal with the shock of how to LIVE their lives with cancer; with access to support and information as and when they need it." The Wirral Coastal Walk is organised by North Wirral Rotary Club. It costs ₤5 for an adult to enter and ₤1 for a child, payable at the start of the day. If you'd like to join the Maggie's team, get a free t-shirt and raise vital funds for local cancer support, please, please, please, get in touch on:- 0151 334 4301 or send an email to:- ClattebridgeFundraising@MaggiesCentres.Org. To find out more about Maggie's Merseyside visit the website or follow Maggie's on Facebook. A Scandinavian fitness trend has reached Crosby and St. Joseph's Hospice and the Friends of Crosby Beach will be teaming up to bring you it's 1st ever plogging event. For those not yet in the know, plogging combines jogging and picking up litter and comes from the Swedish term:- "plocka upp," meaning pick up. The new fitness craze is sweeping the globe and ridding the streets of rubbish so we're asking everyone from across Crosby to join us for some plogging on the beach, on Sunday, 24 June 2018. All those taking part should meet at the coastguard station on Hall Road, Crosby, by 10.30am. It's completely free and family friendly but there will also be a collection on the day to raise money for the hospice. Julie McAdam, senior fundraiser at St. Joseph's Hospice said:- "This will be a fun event as well as a fantastic way to get outdoors and get fit. Plogging is a great community activity as we will all be working together to clean up the beach as well as raising money for a very worthwhile cause. We'll even have boot camp fitness instructor Barry Fry to get everyone warmed up at the start. Please come along and join us for what we're sure will be a great day." Pay and display parking will be available on the day. For more information, visit:- Jospice.Org.UK or call the fundraising team on:- 0151 932 6044 or email:- Events@Jospice.Org.UK.